Kipp Hopkins explores a park in Tokyo. 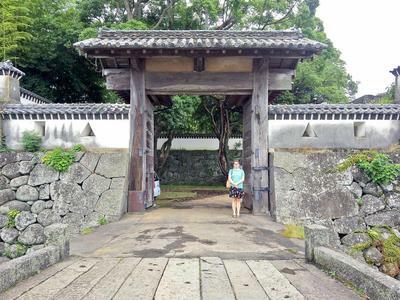 A lifelong interest in Japanese culture has paid off for blogger and author Kipp Hopkins, who was recently hand-picked to fly across the world and film a segment on a television show in Japan. Hopkins’ blog, called Washoku Day: Learning the Art of Japanese Cooking, features posts about some of her favorite foods from Japan, and follows her exploration of learning how to work with those foods in her own kitchen. A blog post from last summer about making a type of steamed fish cake called Kamaboko caught the attention of the Japanese television program “Who Wants to Come to Japan,” a weekly program that seeks out foreigners with interest in the country’s culture. “The producers had never heard of anybody outside of the country making Kamaboko in their homes, and it caught their attention so much that they based my entire segment around that aspect of my interests,” she said. Hopkins received the email about the show’s interest on May 1, and one week later she had a film crew in her kitchen to shoot her cooking Kamaboko. One month after the initial filming she was officially invited to Japan, party of one, and two months later she touched down at Narita Airport outside of Tokyo. Hopkins spent the first night in Tokyo, and the following day she and the film crew make their way to the Gotõ islands off the coast of Japan. The main stop was on Fukue Island, the biggest of the islands in the chain. There, she met three brothers who owned a business that specialized in Kamaboko. She stayed on the island for three days, and even fished off the coast for the fish she cooked Kamaboko from. After filming in Gotõ, the crew made their way to Sendai, where they wrapped the last two days of filming for the program. After filming wrapped, Hopkins had four days to herself in Japan. Making the most of it, she explored several different parts of Tokyo, which was highlighted by a trip to a local park, complete with temples, shrines and the ever-popular cherry blossoms. “It was all such a whirlwind, but there were times where I would be walking around, especially those last few days, where it really hit me that I was in Japan,” she said. The episode featuring Hopkins has since aired, and she has taken to her blog to give a detailed account of her experience. The second blog post, titled Japan Trip Two: Filming at My House, was posted last week, and there are more to follow.